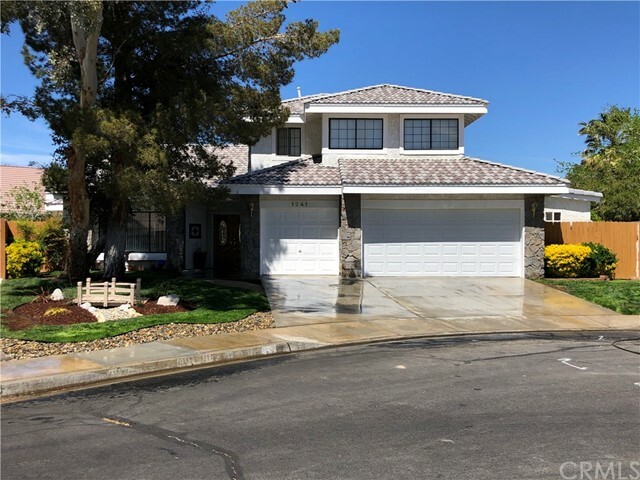 All Ridgecrest homes currently listed for sale in Ridgecrest as of 04/20/2019 are shown below. You can change the search criteria at any time by pressing the 'Change Search' button below. If you have any questions or you would like more information about any Ridgecrest homes for sale or other Ridgecrest real estate, please contact us and one of our knowledgeable Ridgecrest REALTORS® would be pleased to assist you. "FIRST TIME ON MLS SINCE WAS BUILT! UNIQUE 6 Bed 4 Bath customized home in highly desired Heritage Village! End of cul-de-sac provides privacy, peace & quiet! There are so many unique features, you just must see this one for yourselves! NEW Quartz counters, high-tech hood, gorgeous gas range, fabulous custom-modern backsplash and modern kitchen faucet. Huge Formal living & dining rooms AND separate family room w/ gas fireplace that is adjacent to kitchen & dining area. Open Floorplan! DOWNSTAIRS MASTER BEDROOM SUITE WHICH INCLUDES A SEPARATE PRIVATE OFFICE w/ ITS OWN PRIVATE BATHROOM AND PRIVATE ENTRANCE! YES, REALLY!! Yet another DOWNSTAIRS BEDROOM w/ French doors leading to private covered patio, adjacent to a full bathroom. 3 MORE bedrooms upstairs w/ a full bathroom as well. HUGE bedroom that can be used as a library, office, entertainment space or whatever! Double doors lead you into this home and double French doors lead you into the amazing resort style backyard with gazebo and even a BEACH area! YES, A BEACH! Did I mention the OUTDOOR KITCHEN?? Sink, garbage disposal, gas stove, BRAND NEW dishwasher AND island with granite counters! The outdoor kitchen also boasts a HUGE built in glass round table with its own lazy susan! ENTERTAINER'S DREAM COME TO LIFE! Also includes 2 attached separate storage areas for all your stuff! New refreshed designer landscaping in the front yard for that beautiful curb appeal! Designer underwater succulent garden for the fun factor!" "Cute and cozy Mobile home on just under half an acre. Centrally Located, not far from town, or fun opportunities. Property has a 12 X 12 shed with 220 Power, and a 20' Conex for storage needs. Newer wood fencing lines the front of the property for ultimate privacy. Property has Ultiate potential, as it is zoned for residential and commercial use. Buyers to Verify. Association Amenities: None # of RV Spaces: 0 Special Features: SHNONE Frontage Type: Dirt Road Lot Location Type: Standard Location Landscaping: Natural # of Attached Spaces: 0 # of Detached Spaces: 0"